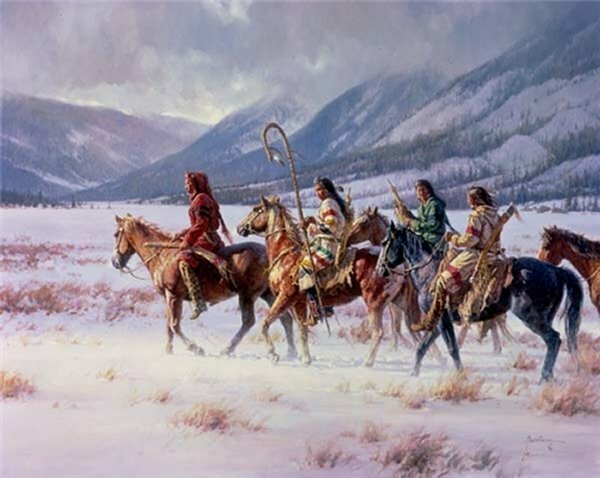 Winter of the Apsaroke by Martin Grelle ~ Some of Grelle's most beautiful and dramatic paintings feature the magic of light on snow, and that is certainly the case with Winter of the Apsaroke. The cold snow and gray clouds in the background contrast spectacularly with the warm, rich tones in the riders and horses. The winter sun streams down on them electrifying the beautiful colors in their robes. What a dramatic scene!